It was always amazing to me that any time a conference was held in Dallas when I worked, men from out of town would want me to take them to buy cowboy boots. They would always find boots and have the store ship them to their home. It looks like that tradition is still alive and well in Austin because in big bold gold letters on this boot shop window was “We Ship Worldwide”! Since Austin is our state’s Capitol, it hosts people from all over the world on a regular basis. This for my green rainbow photo today. Someone I used to work with bought cowboy boots when she was in Texas a few years ago. In fact her whole family bought a pair. I think all visitors to Texas associate Texas with boots and cowboy hats. I love the colors and lighting. Such a vibrant shot! Great, bright colours! the green really pops despite other nice colours around it. aces! Cowboy boots are just different from ordinary boots. You need the southern drawl to go with them, of course! Jeff and I both had a pair when we were line dancing- they were made to be comfortable and they were. Sadly, my knees make it impossible to do that now but we really had so much fun. I have no idea where they were made though. Anyway! 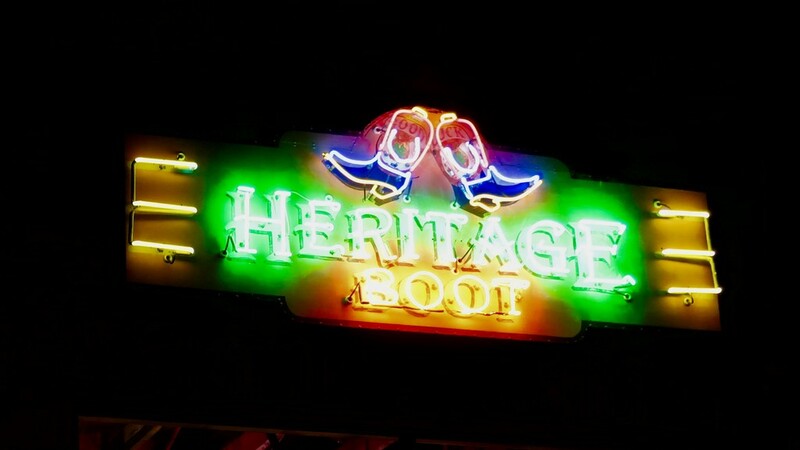 Love your neon sign- great green shot! My dad had these wonderful cowboy boots. When he passed, I gave them to my son. I took a photo back in 2014. I miss my boots that I got in Dallas! @pcoulson surprisingly, cowboy boots are so comfortable, you just have to get the correct size. @danette fancy cowboy boots are so in style now. You will have to buy some more! @olivetreeann cowboy boots are made for line dancing! @maggiemae well, I do have the drawl! @nicolecampbell see, cowboy boots are quite a travel souvenir! @henrir your guy hasn’t ever worn anything other than cowboy boots and cowboy hats, has he?! @mittens @grammyn @beryl @carole_sandford @jacqbb @joemuli @summerfield @sugarmuser @linnypinny @happysnaps @bizziebeeme @pusspup thank you all for commenting on my green photo! So fun! What a cool neon sign, LouAnn! So colorful!